Next up in our Compass Box quartet was The Double Single, named for it bringing together one single grain whisky (Girvan) and one single malt whisky (Glen Elgin)… with the idea that bringing them together elements beyond the sum of their parts. For one, on the nose it reminded of Mr Kipling’s “French Fancies”. And what a remarkable palate. It was without a doubt the preferred whisky to accompany a good cigar. In short, we loved it! And what do the folks at Compass Box have to say? Flavour Descriptors In The Double Single we have combined single malt whisky from the Glen Elgin distillery and single grain whisky from the Girvan distillery. The elegantly complex, ethereal malt whisky character is balanced on a decadent cushion of rich, sweet, vanilla-tinged grain whisky character. Recommendations The combination is a deeply satisfying yet versatile whisky, perfect served as a rich aperitif before a winter’s dinner, or as a rewarding post-prandial any time of year. 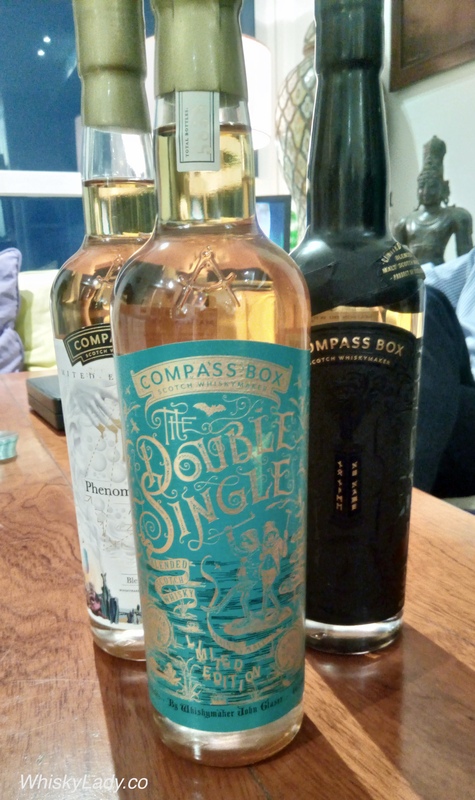 This entry was posted in Blends, Scotland and tagged Compass Box, The Double Single by Carissa Hickling. Bookmark the permalink.